I wasn’t just going on and on about the Chickpea in previous post for the fun of it! 🙂 I am absolutely enamoured by this main dish salad. It’s full of fantastic good for you ingredients: Spinach, Chickpeas, Olives and Oven Roasted Cauliflower and is set off beautifully by the home-made dressing. I’ve adapted this from a Fine Cooking Magazine I picked up at the airport last year on a visit to Georgia and have been making both the Chickpeas with Bay and Herbs and this Roasted Cauliflower and Chickpea Salad ever since. Fine Cooking was smart and suggested making a pot of their Chickpeas with Bay and Herbs and using them in an assortment of dishes, including the one this salad was inspired by. The original recipe had chicken, but this salad stands as it’s own main dish in terms of protein and “satiety” factors. It also originally had arugula, a pricey ingredient in my neck of the woods, so in goes the less expensive and more readily available spinach. I have started upping the flavor factors a bit in this salad – the Oven Roasted Cauliflower gets sprinkled with a bit of Michael Chiarello’s Fennel Spice Rub and a zippier salad dressing makes sure that the flavor isn’t lost in a sea of milder ingredients. A few thinly sliced red onions add in a little bite, too, that was missing. You can’t go wrong with this salad if serving vegetarians or if just looking for something a bit healthier to eat. Try as is, or add your own variations – you’ll love it…and might forget to ask “Where’s the Beef?” The chicken originally used in this recipe was just a simple oven roasted chicken, but a few pieces of left over chicken would work, too, if you want add it in. Position rack in upper third of oven, preheat to 425 degrees. For easy cleanup, line an oven tray or cookie sheet with foil. Place cauliflower on foil, toss with olive oil, sprinkle with Fennel Spice Rub and salt and pepper. Roast about 20 – 25 minutes until cauliflower is lightly golden and to desired tenderness. Combine all ingredients and toss with dressing, serve immediately. If making ahead, toss all ingredients together and add the spinach last minute. May use canned chickpeas, rinsed and drained. Feel free to use yoyr favorite spice mixture ob the cauliflower. 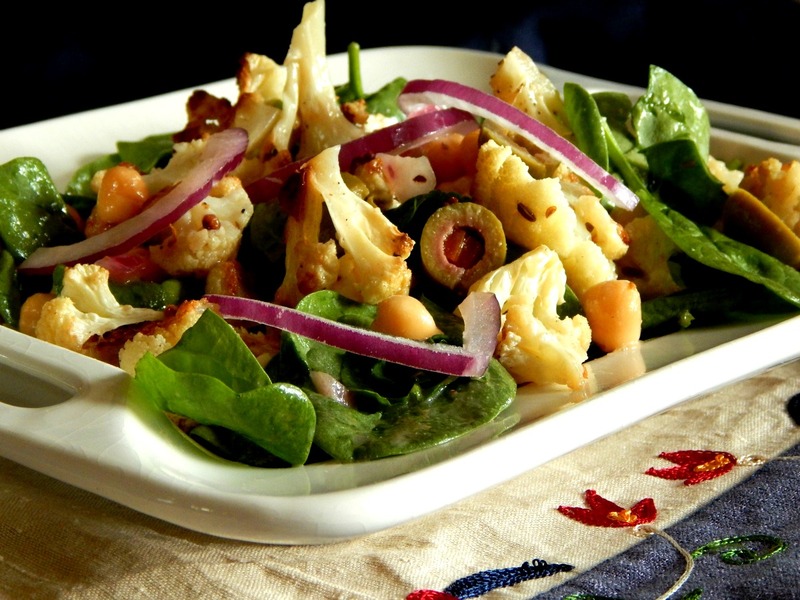 Do try the Red Onion Vinaigrette on this salad – it really sets it off to perfection! This entry was posted in Click here for Bargain Meals, Click here for Fabulous Food Posts and tagged Chickpeas, Dried Beans, Fine Cooking, Main dish salad, Olives, Red onion, Salad, Vegetarian Meal. Bookmark the permalink. I love roasted cauliflower. This looks great!!! Roast cauliflower is the best isn’t it? It turns into an entirely different vegetable!